Great for offices, schools and warehouses, this Sandusky Steel Freestanding Cabinet provides secure storage for office products and other essentials. Four fully adjustable shelves on 2-inch centres plus a raised bottom shelf offer ample space, while the three-point door lock system and three sets of hinges per door help keep items safe and secure. Built with welded, powder-coated steel, this tough cabinet holds up to 200 lbs. per shelf and comes backed by a 1-year warranty for peace of mind. Montego Bay One Door Multi-Purpose Storage Cabinet by Home Styles is just what you've been looking for to meet your outdoor as well as indoor storage needs. Showcasing an island inspired design in a versatile Eucalyptus finish and constructed of eco-friendly material. The 16 inch Base Cabinet combines the storage of a 20 inch long drawer and the versatility of a door that can be easily mounted to open left or right. The heavy duty drawer has a half-inch thick bottom and metal sides that roll on smooth roller glides, making it perfect for storing heavy duty items like tools. The cabinet includes one adjustable shelf and 1 inch thick worktop. Customizable, functional and durable, it coordinates perfectly with other pieces in the Elite Collection. Constructed from non-toxic, laminated composite woods with a sturdy MDF backer. Ships Ready to Assemble, includes an instruction booklet for easy assembly and has a 5-year manufacturer's limited warranty on parts. Manufactured in Canada and meets all North American safety standards. 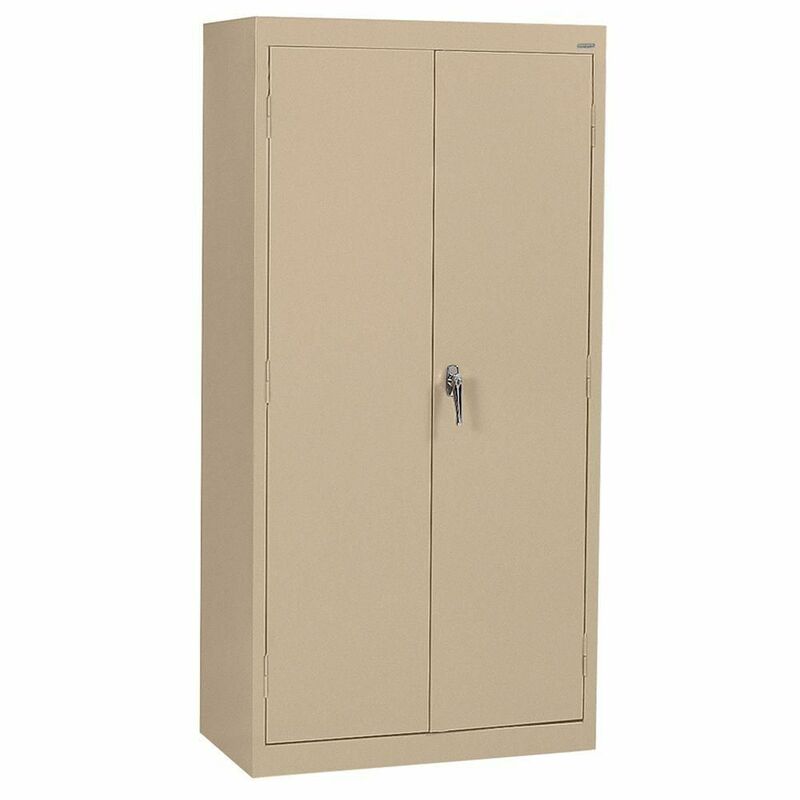 Classic Series 72-inch H x 36-inch W x 18-inch D Steel Freestanding Storage Cabinet in Tropic Sand Great for offices, schools and warehouses, this Sandusky Steel Freestanding Cabinet provides secure storage for office products and other essentials. Four fully adjustable shelves on 2-inch centres plus a raised bottom shelf offer ample space, while the three-point door lock system and three sets of hinges per door help keep items safe and secure. Built with welded, powder-coated steel, this tough cabinet holds up to 200 lbs. per shelf and comes backed by a 1-year warranty for peace of mind. Classic Series 72-inch H x 36-inch W x 18-inch D Steel Freestanding Storage Cabinet in Tropic Sand is rated 4.7 out of 5 by 38. Rated 5 out of 5 by jd from Purchased 2 of these cabinets. They came fully assembled except for the handle/lock and placemen... Purchased 2 of these cabinets. They came fully assembled except for the handle/lock and placement of shelves. Read several reviews prior to purchase that complained about them being hard to assemble, but do not understand this as they were fully assembled when received. The shelves were very easy to install, and there were 5 of them. You could use one to bring the bottom up to level with the door jam or use the bottom as an additional 6th shelf. They are very sturdy. Rated 5 out of 5 by Jonathan from These cabinets are a great buy with little to no assembly required before placing & using them. P... These cabinets are a great buy with little to no assembly required before placing & using them. Plenty of adjustable shelves that will hold some weight also. Very satisfied!! Rated 3 out of 5 by Honest from This unit meets my storage needs, but there is nothing... This unit meets my storage needs, but there is nothing special about it. Had to grind down the square shaft on the door lock because it hit the shelf edge inside causing the door to bow out. I realize that I could move the shelf up or down to clear, but it is right where I want it. Rated 5 out of 5 by NetworkTech from I work out of my office but I have a lot of industrial devices and accessories that work with so ... I work out of my office but I have a lot of industrial devices and accessories that work with so I needed something that held a lot more weight and wouldn't start flexing or get easily damaged. For the price, I am so happy with this product. It is all welded and the shelves are adjustable. It arrived undamaged and the handle hardware and shelves went together easily. The tropic sand color is a nice change from the typical office gray or white.The biggest challenge was just finding a truck to transport it. It's completely full now and the shelves are holding just fine without bending. Rated 5 out of 5 by Critter from Love these at school! Easy assembly of locking mechanism, easy... Love these at school! Easy assembly of locking mechanism, easy to move. Wish they had feet though. Floor mopping will cause the bottom to rust and stain floors. Rated 5 out of 5 by HomeDepotCustomer from Works great.... Works great.